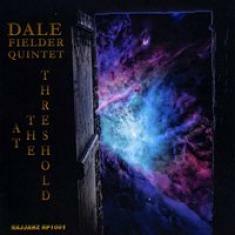 Los Angeles,March, 18th, 2019 - At The Threshold is a wonderful album by acclaimed veteran jazz saxophonist, composer and band leader Dale Fielder who is a multi-instrumentalist and plays all four saxophones:soprano, alto, tenor and baritone with equal authority! Joining Dale here are the talented group of musicians who accompany and support him. Some members, like pianist Jane Getz, has played with him for more than 20 years. One can experience their chemistry and feel it in the music which they create. The remainder of Dale's D.F.Q. (Dale Fielder Quintet) are trumpeter Nolan Shaheed, bassist Bill Markus and Don Littleton on drums and they all play their role in the groups music creation and sound! Adding additional instrumentation is Jyotirmay Roychowdrury on tabla and Taren Bhattacharya on assorted Indian percussion. headliner at a concert at Fordham University in New York City. At The Threshold wonderfully blends the new, the original and the familiar into a continuous taspery of sound! As a result, the title refers to him moving to a new stage of his career as well as encouraging us all to be aware of when we are artistically, spiritually or otherwise moved to the threshold of being a greater expression of art and of our divine self. At The Threshold was recorded at Tritone Studios by Talley Sherwood, then mixed and mastered by Maurice Gainen at Maurice Gainen Productions. It is an eclectic mix of original jazz compositions and interpretations of several standards and spiritually oriented selections. The sound is of high quality and the music is excellent and inspirational and finds Dale Felder achieving new musical heights! Dale is a prolific artist, he composed 4 of the 12 tunes here and has a number of very strong albums. You'll be able to At The Threshold to the "very strong" category of Dale Fielder releases! Contact and visit the music world of executive producer Herman Brooks at the two links below!